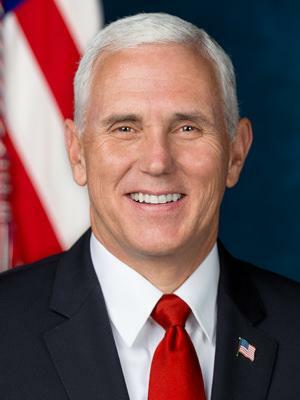 Michael Richard Pence was born on the 7th June 1959, in Columbus, Indiana USA, of part-Irish descent, and is a politician now best known for being the 48th Vice President of the United States. Previously, he was the 50th Governor of Indiana (2013-2017). He is also known as a lawyer. His career has been active since 1986. So, have you wondered how rich Mike Pence is, as of early 2018? According to authoritative sources, it has been estimated that the total size of Mike’s net worth is over $2 million, accumulated through his successful involvement in the law and politics. Mike Pence was raised with five siblings in his hometown by his father, Edward Joseph Pence Jr., and his mother, Nancy Jane. He attended Columbus North High School, where he became interested in politics, and was a volunteer with the Bartholomew County Democratic Party. Upon matriculation in 1977, he enrolled in Hanover College, graduating with a BA degree in History in 1981. Right after graduation, he started working at the college as a counselor for the next two years, before continuing his education at the Indiana University’s Robert H. McKinney School of Law, from which he earned his JD degree in 1986. Subsequently, Mike’s career as a lawyer began that year when he started working in private practice. Two years later, he became involved in politics as he decided to run for a congressional seat during the same year, and again in 1990, both of which he lost to Democratic official Phil Sharp. Nonetheless, he became a part of the State Policy Network in the following year, and at the same time, he was chosen to become the president of the Indiana Policy Review Foundation. Mike served in that position until 1993, when he decided to run his own “The Mike Pence Show” on WRCR-FM radio in Rushville, Indiana. Afterwards, between 1995 and 1999 he was a host of a political talk show, which marked the beginning of an increase of his net worth. Nevertheless, Mike’s big comeback was in 2000, when he ran again to become the US Representative for Indiana’s 2nd congressional district, this time winning it. Since then his career has only gone upwards as well as his net worth, as he has served as the Chairman of the Republican Study Committee from 2005 to 2007, and during 2006 he ran for leader of the Republican Party in the House of Representatives, and although he was defeated by Representative John Boehner, Mike didn’t give up, winning it in 2009. To speak further about his career, Mike’s next major success came in 2013, when he won the election for the 50th governor of Indiana, and served in that position for the next four year, which added a considerable amount to his net worth. Most recently, he won the position of the 48th Vice President of the United States, defeating Tim Kaine with 48.2%, so his net worth is certainly rising. When it comes to speak about his personal life, Mike Pence has been married to Karen Pence since 1985; the couple has three children together. Their current residence is in the official residence of the Vice President of the United States, at Number One Observatory Circle, located in Washington, D.C.
1 We have rights in America. In tandem with those rights, we have responsibility. Whatever type of journalist we are, whether it be in the entertainment business, or as professional journalists, we always have the consequences of the way we present fact and information. 2 America wins when we trade and export and import. 3 Trade means jobs, but trade also means security. The time has come for all of us to urge the swift adoption of the Trans Pacific Partnership. 4 The most important job I'll ever have is spelled D-A-D.
5 Saddam Hussein was a nightmare for the Iraqi people, and his execution marks the end of an era when violence against innocent men, women and children was a means to wealth and power. 6 I was raised to believe in hard work, in faith and family. 7 The United States cannot and should not discriminate on the basis of religion. The free exercise of religion is at the very heart of our constitutional guarantee for all persons of this country. 8 I think to the extent Republicans depart from the historic commitment, we do so at our peril. 9 We should seriously rethink a tax code that makes it less and less possible for one parent to stay home with the kids and replace it with a family-friendly system of tax collection. 11 Negative personal attacks have no place in public life and serve to erode public confidence in our basic institutions of government. 12 The Republican majority, left to its own devices from 1995 to 2000, was a party committed to limited government and restoring the balances of federalism with the states. Clearly, President Bush has had a different vision, and that vision has resulted in education and welfare policies that have increased the size and scope of government. 13 Standing at a Christian music festival in Asbury, Ky., in the spring of 1978, I gave my life to Jesus Christ, and that's changed everything. 14 What is real is that adultery destroys tens of thousands of families every year across America. What is real is that adultery scars tens of thousands of children emotionally and psychologically every year. What is real is that adultery is an open wound in a relationship which more often than not overflows into domestic violence or worse. 15 began to meet young men and women who talked about having a personal relationship with Jesus Christ, and while I cherish my Catholic upbringing and the foundation that it poured in my faith, that had not been a part of my experience. 16 It's a privilege to serve in Washington, D.C., but I never lose sight of what the Lord has called me to do in my life. And that is to be, first a husband, and then a father, and succeed there from His perspective, and He'll take care of everything else. 17 I'm interested in continuing our conversation about the discomfiture I picked up in the mainstream media with one particular element of this debate. It was this discomfort with a law against adultery. 18 I think it's time for the media and our leaders to get real and start telling the truth about the impact of adultery on our national life. 19 There's overwhelming evidence... circumstantial and otherwise, to suggest a connection between Iraq and al-Qaeda. 20 I grew up with a front row seat to the American dream. 21 The heroes of my childhood were Martin Luther King Jr. and John F. Kennedy... but I was inspired by the ideals of our 40th president and became a Republican. 22 There is an enormous amount of evidence that Saddam has weapons of mass destruction, is doing his best to develop more lethal weapons, and funds and supports terrorism. 23 I just always believe that we should not reward people with citizenship whose first act in this country was a violation of the law. And I continue to hold that view. But let me say, I think there is plenty of room here for compassion. And there's plenty of room here for crafting a solution that will deal with this issue in the long term. 24 Donald Trump is a good man, and he will make a great president of the United States of America. 25 The choice could not be more clear. Americans can elect someone who literally personifies the failed establishment in Washington, D.C., or we can choose a leader who will fight every day to Make America Great Again. 26 I haven't agreed with every one of my Republican colleagues or Democratic colleagues on every issue. But I'm supporting Donald Trump because we need change in this country. 27 We cannot have four more years apologizing to our enemies and abandoning our friends. 28 I'm not against anybody. 29 My family and I couldn't be more happy for the opportunity to run with and serve with the next president of the United States. 30 Let's resolve here and now that Hillary Clinton will never become the president of the United States of America. 31 If you want a president who will upend the status quo in Washington, D.C., and appoint justices of the Supreme Court who will uphold the Constitution, we have but one choice, and that man is ready. This team is ready. Our party is ready and when we elect Donald Trump, the 45th president. 32 Together, we will make America great again. 33 On the world stage, Donald Trump will lead from strength. 34 When Donald Trump becomes president of the United States of America, the change will be... huge. 35 Hillary Clinton wants a new title, and I would, too, if I already was secretary of the status quo. 36 I watched my mom and dad build everything that matters - a family, a home and a good name. 37 We will win the hearts and minds of the American people with an agenda for a stronger and more prosperous America. 38 We can choose a leader who will fight every day to make America great again. 40 We'll uphold our treaty obligations, including the mutual defense agreement that is NATO. 41 A campaign ought to demonstrate the basic human decency of the candidate. That means your First Amendment rights end at the tip of your opponent's nose - even in the matter of political rhetoric. 42 I'm grateful to Donald Trump's pro-life views, and I'm grateful that he's expressed those views so publicly and openly. 43 Negative campaigning is wrong. 44 The so-called 'Employee Free Choice Act' envisions a world where workers would be denied privacy and forced to vote in an atmosphere of intimidation. 45 When I was young, I watched my mom and dad build everything that matters: a family, a business and a good name. I was raised to believe in hard work, in faith and family. My dad, Ed Pence, was a combat veteran in Korea. 46 Regardless of any title I'll ever hold, the most important job I'll ever have is spelled D-A-D.
47 Don't Ask, Don't Tell was a successful compromise in 1993; and so that compromise should remain. 48 Fighting for free enterprise means standing up for free markets. The freedom to succeed includes the freedom to fail. We must defend entrepreneurial capitalism against the onslaught of the American Left. 49 I truly do believe that history teaches that weakness arouses evil, and whether it be the horrific attack in France, the inspired attacks here in the United States, the instability in Turkey that led to a coup. 50 What I am for is protecting, with the highest standards in our courts, the religious liberty of Hoosiers. 51 Anybody that's been in Indiana for five minutes knows that Hoosier hospitality is not a slogan, it's a reality. 52 I promise you that when the circumstances arise where I have a difference on policy or on presentation, I have - I can tell you in my heart, I know - I would have no hesitation, were I privileged to be vice president, to walk into the president's office, close the door, and share my heart. 53 It's very, very humbling, and I couldn't be more honored to have the opportunity to run with, and serve with, the next president of the United States. 54 I support free trade, and so does Donald Trump. 55 I am very supportive of Donald Trump's call to temporarily suspend immigration from countries where terrorists influence and impact represents a threat to the United States. 56 As governor of Indiana, if I were presented a bill that legalized discrimination against any person or group, I would veto it. 57 There are no kinder, more generous, more welcoming, more hospitable people in America than in the 92 counties of Indiana. 58 I believe we need to focus first and foremost - as Donald Trump has done with such force and such passion - on border integrity and building the wall. 59 Reasonable people can differ on whether or not we should have gone into Iraq. 60 Indiana is a state that works because conservative principles work every time you put them into practice. 61 The American people are tired of being told. They're tired of being told that this is as good as it gets. They're tired of hearing politicians in both parties tell us that we'll get to that tomorrow while we pile a mountain range of debt on our children and our grandchildren. 62 In my home state of Indiana, we prove every day that you can build a growing economy on balanced budgets, low taxes, even while making record investments in education and roads and health care. 63 Donald Trump gets it: he's the genuine article. He's a doer in a game usually reserved for talkers. And when Donald Trump does his talking, he doesn't tiptoe around the thousand new rules of political correctness. 64 Hillary Clinton essentially offers a third Obama term. And the role is perfect for her. She championed 'Obamacare' because years earlier she had all but invented it. 65 You shut the door, you tell the boss exactly what you think. But when the door opens, the job of the vice president is to stand right next to the president and implement the policy that he's decided. And I'm prepared to do that. 66 Donald Trump will never turn his back on those who serve and protect us at home and abroad. 67 Donald Trump understands the anxiety and aspirations of the American people like no leader since Reagan. 68 I don't believe Rush Limbaugh has a racist bone in his body. 69 Under Donald Trump, our deals will be smarter, our soldiers will have what they need, and our veterans will have what they earned. We will secure our borders, protect our nation. In all this, we will be more serious. And when we do, this nation will start winning again. 70 What I want the Congress of the United States to do, and frankly what I would like to see the President of the United States of America do, is speak a word of support to the people of Iran. 71 You bet every member of Congress who votes for this bill ought to read it, read it thoroughly, and understand that what we're looking at here amounts to nothing more than a government takeover of our health care economy, paid for with nearly a trillion dollars in new taxes on individuals and small businesses. And it must be opposed. 72 The reality is that during the Reagan years, for instance, we doubled the amount of revenue that we were sending to Washington, D.C. after the tax cuts took effect. 73 We ought to affirm the fact that hundreds of thousands if not millions of Iranians are risking their liberty and even perhaps their lives to take a stand for the values upon which we have really founded this nation. 74 Here in Indiana, we run a nationally-recognized program called the Healthy Indiana Plan. The Healthy Indiana Plan offers the uninsured an affordable health care plan with savings accounts that they control. 75 If I only had 12 years left to live, I'd want to live it as a member of Congress because that was the 12 longest years of my life. 76 I'm a small-town kid who grew up with a cornfield in the back yard and dreaming of serving my country in public office. 77 I abhor discrimination. The way I was raised was like most Hoosiers, with the golden rule, that you should do unto others what you'd have them do unto you. 78 We want to make it clear that Indiana's open for business. We want to make it clear that Hoosier hospitality is not a slogan, it's our way of life. It's the reason why people come here from around the world and they come back again and again. Because Hoosiers are the kindest, most generous, most decent people in the world. 79 Hoosiers don't believe in discrimination. 80 It is a tragedy indeed that new generations, taking office, attribute failures in governance to insufficient power, and seek more of it. 81 Like every American, I will never forget where I was on the morning of September 11, 2001. As a member of Congress from Indiana, that day my duties took me to Capitol Hill and to sights and sounds I will never forget. 82 Our founders insisted that protecting the states' power to govern themselves was vital to limit the power of Washington and preserve freedom. 83 Budgets are moral documents. Federal funding should reflect the priorities and the values of the majority of the American people. 84 I said after 2006 that Republicans didn't just lose our majority, we lost our way. I mean, our party walked away from the principles that men in our national governing majority first in 1980 and again in 1994, and the American people walked away from us. 85 To those who say it would be too difficult to repeal and replace Obamacare, I say it's a two step process. We repeal the Pelosi Congress in 2010 and replace the Obama Administration in 2012. 86 I have prayed with the families and wept at the funerals of Hoosiers who did not shrink from 9/11 but grew into heroes whose names will forever be engraved in the heart of a grateful nation. 87 I occasionally got called the Rush Limbaugh of Indiana, but most people knew that my style was different. 88 It's time for conservative Americans to right the ship again. 89 My votes against the education bill and my votes against the Medicare bill got huge play at home. 90 Let's win the peace and democracy the good people of Iraq so richly deserve after decades of tyranny. 91 It is a rare piece of legislation indeed where there is so much agreement about the goals. 92 By requiring that any surplus in Social Security taxes be returned to the American people in personal savings accounts, the plan ensures that Social Security taxes will be used for Social Security. 93 The reality is the cap-and-trade legislation offered by the Democrats amounts to an economic declaration of war on the Midwest by liberals on Capitol Hill. 94 It is not for the State Department or even the Secretary of State to say when and how the resources of the American people will be spent. 95 As we begin this debate, I am confident that we will hear the supporters of this bill argue in the name of Ronald Reagan that this research is consistent with his long-held views about the sanctity of life. 96 I never thought I'd live to see the day that an American administration would denounce the state of Israel for rebuilding Jerusalem. 97 It's time to save the U.N. from its own scandals and mismanagement. It's time for U.N. Reform with teeth. 98 As a conservative who believes in limited government, I believe that the only check on government power in real time is a free and independent press. 99 In the last four years under the Patriot Act, we have seen a great increase in the ability of law enforcement officials to investigate and track terrorists. 100 The American people know what's necessary to get this economy moving again. It's fiscal discipline in Washington, D.C. and across-the-board tax relief for working families, small businesses and family farms. 101 It's time for conservative Americans to do what Reagan did. 102 I mean, the reality is unemployment today - over 14 million Americans are unemployed. That's exactly what it was a year ago. I mean, this - the American people know we can't borrow and spend and bail our way back to a growing economy. 103 More than anything else, let me be clear - we need to be willing to fight for freedom, and free markets, and traditional moral values. That's what the American people want to see this movement and this party return to. 104 Power is an instrument of fatal consequence. It is confined no more readily than quicksilver, and escapes good intentions as easily as air flows through mesh. 105 You know, Hoosiers recognize pork when we see it. And they recognize what bailing out every failing business in America means - We're burying generations under a mountain range of debt. 106 A republic - if you can keep it - is about limitation, and for good reason, because we are mortal and our actions are imperfect. 107 I opposed the Medicare prescription drug entitlement. I opposed the Wall Street bailout. I opposed the stimulus bill. 108 Well, I think the reality is that as you study - when President Kennedy cut marginal tax rates, when Ronald Reagan cut marginal tax rates, when President Bush imposed those tax cuts, they actually generated economic growth. They expanded the economy. They expand tax revenues. 109 Anybody who is familiar with the historical data from the IRS knows that raising income tax rates will likely actually reduce federal revenues. 110 All we're getting from the Democratic majority in Congress and from this White House is more bailouts, more spending, more planned stimulus, more deficits and debt, and the American people have had it. 111 I opposed No Child Left Behind, I opposed the Medicare prescription drug bill, I opposed the Wall Street bailout. What the American people are starting to see is that Republican, Republicans on Capitol Hill get it and the Democrats, from the White House to Capitol Hill, just don't get it. 112 The Religious Freedom Restoration Act in Indiana does not give anyone the right to deny services to anyone in this state. It is simply a balancing test used by our federal courts and jurisdictions across the country for more than two decades. 113 There's going to be no compromise on repealing Obamacare lock, stock and barrel. 114 I strongly oppose the Employment Non-Discrimination Act. We must stand for the right of every American to practice their faith according to the dictates of their conscience, whether it be in the public square or in the workplace. 115 Several millennia ago, the words were written that a man should leave his father and mother and cleave to his wife, and the two shall become one flesh. It was not our idea; it was God's idea. 116 If I saw a restaurant owner refuse to serve a gay couple, I wouldn't eat there anymore. As governor of Indiana, if I were presented a bill that legalized discrimination against any person or group, I would veto it. 117 People in both parties are restless for change, ready to break free of old patterns in Washington. 118 Most climatologists agree that, at best, global warming is a theory about future climactic conditions and cannot be proven based upon the historic record. 119 For me, it all begins with faith; it begins with what matters most, and I try and put what I believe to be moral truth first. My philosophy of government second. And my politics third. 120 Despite the hysteria from the political class and the media, smoking doesn't kill. 121 The anguish in London is a vivid reminder of why we cannot relent in taking the steps necessary to defend our homeland from the present terrorist threat. 122 In Indiana, the Affordable Care Act will raise the average cost of health insurance in the individual market by an unaffordable 72 percent. 123 The true legacy of 9/11 cannot be found among political leaders of the day, but in the citizen soldiers and public safety personnel who answered that day with courage and selflessness. 124 Uh, do I believe in evolution? I embrace the view that God created the heavens and the earth, the seas and all that's in them. The means that he used to do that, I can't say, but I do believe in that fundamental truth. 125 I'm a Christian, a conservative, and a Republican, in that order. 126 Behind every great man is a woman rolling her eyes. 127 If Planned Parenthood wants to be involved in providing counseling services and HIV testing, they ought not be in the business of providing abortions. 128 Well the truth is, Republicans didn't just lose a few elections, we lost our way. 129 For more than forty years, the United States Congress has shamelessly used payroll taxes intended for Social Security to fund big government spending. 130 We are here simply to decide whether Congress should take the taxpayer dollars of millions of pro-life Americans and use them to fund the destruction of human embryos for research. 131 And conservatives know that if you reject these principles of limited government and urge others to reject them you can be my ally, you can be my friend but you cannot call yourself a conservative. 132 To date, embryonic stem cell research has not produced a single medical treatment, where ethical, adult stem cell research has produced some 67 medical miracles. 133 The Patriot Act is essential to our continued success in the war on terror here at home. 134 And my Christianity, first and foremost, governed the way that I tried to deal with people. 135 I'll tell you from my heart, looking at their party further and further to the left, to paraphrase the director of the FBI: I think it would be extremely careless to elect Hillary Clinton. 136 The presidency is the most visible thread that runs through the tapestry of the American government. More often than not, for good or for ill, it sets the tone for the other branches and spurs the expectations of the people. 137 I truly believe that firearms in the hands of law abiding citizen's makes our families and our communities more safe, not less safe. 138 Years ago on my radio show, I used to say, 'I'm a conservative, but I'm not in a bad mood about it.' I've always believed that civility in heavy doses is essential in self-government. 139 The conservative movement today is like that tall ship with its proud captain: strong, accomplished but veering off course into the dangerous and uncharted waters of big government republicanism. 140 It's time to stop the raid on the Social Security trust fund and start allowing Americans to invest their Social Security taxes in personal savings accounts. 141 Human cloning is coming. 143 Comments that suggest that Muslims should be banned from the United States are offensive and unconstitutional. 144 Sadly, embryonic stem cell research is completely legal in this country and has been going on at universities and research facilities for years. 145 No one should be harassed or mistreated because of who they are, who they love, or what they believe. 146 The American economy has been built and sustained by risk-taking entrepreneurs whose pioneering ideas and hard work gave birth to flourishing businesses. 147 While that amendment failed, human cloning continues to advance and the breakthrough in this unethical and morally questionable science is around the corner. 1 Shares a birthday with Northern Irish actor Liam Neeson. Neeson, born on June 7, 1952, is exactly 7 years Mike Pence's senior. 2 2016 Republican vice-presidential nominee. 3 His father was of mostly Irish, and some German, descent, and his mother's family is Irish. 4 U.S. Representative (R-Indiana) (?-2011). 6 Republican. Has represented Indiana's 6th Congressional District since 2000. 7 Hosted a syndicated conservative talk radio show. Pence had a radio studio installed in his congressional office.